The Dorob National Park (DNP), while established as a conservation area, is also a park for the people. Visitors to Dorob have a wide choice of adventures, ranging from scenic flights and hot-air ballooning to skydiving, kite surfing and even a dolphin cruise on a catamaran. The magnitude and extent of the DNP is better understood from an altitude of about 10 000 feet, when flying over it in a Cessna 210, with the high dunes of the Namib Desert lying beneath you to the east and the intense blue of the Atlantic Ocean to the west. Scenic flights are one of the pillars of the Namibian tourism industry, and Namibia’s coastal regions are included in most air-safari flight plans. Scenic safaris are top-selling tour packages because they provide exhilarating and memorable experiences. One moment you are spellbound by the vast dune seas bordering the coast, the next you are looking at the vast grass plains extending to the mountainous areas of the Khomas Hochland – all in one trip. Fly-in safaris provide both access and adventure. 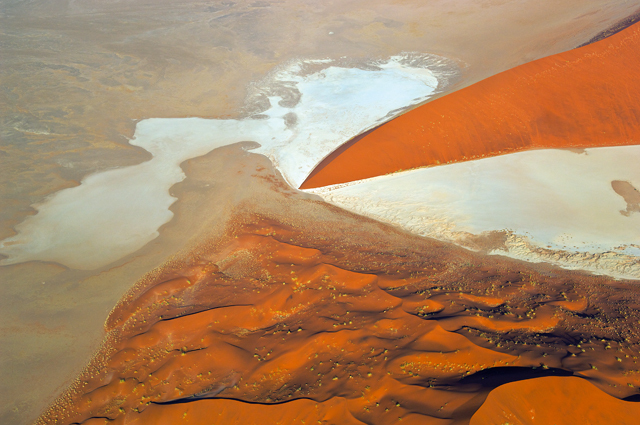 One of the most popular sightseeing excursions by air is a flight over Sossusvlei. Departing from the airfield outside Swakopmund, the pilot guides the aircraft over the northern areas of the Namib-Naukluft Park to where the Tsauchab River meanders towards Sossusvlei. At the famous vlei, deep-orange dune formations await you, as well as the ghost-like Dead Vlei. After a few fly-bys, the aircraft turns around, this time heading for the coast to view places you are not allowed to enter by car. On the return flight tourists can view seal colonies, flamingos, saltpans and the many shipwrecks along the coast. Light aircraft are not allowed to fly low over the lagoons, mud flats and areas frequented by big concentrations of birds. This is to ensure that the feeding birds, especially flamingos, are not disturbed. 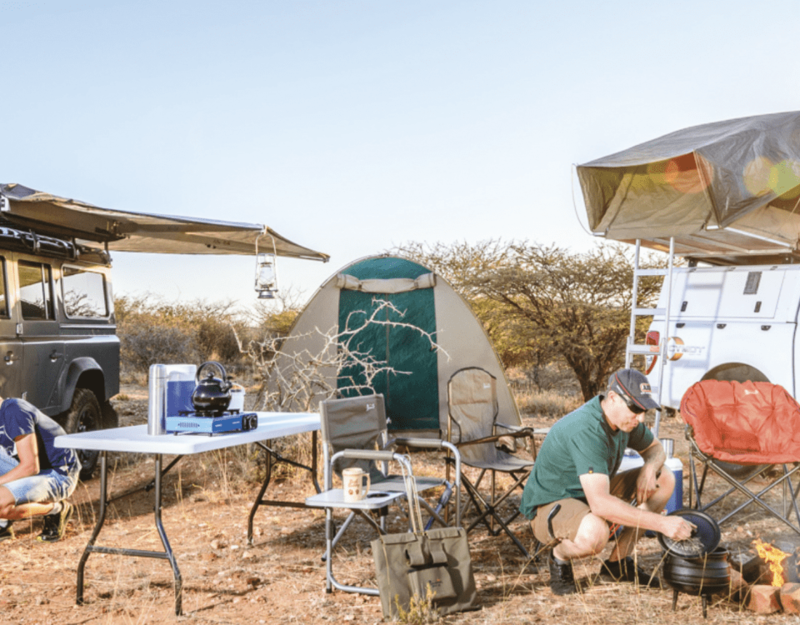 Other popular scenic safaris that depart from the coast are the ones heading northwards over the Skeleton Coast to the remote areas of the Kunene Region as far as the Kunene River, the north-western boundary of Namibia, to show tourists the beautiful Epupa Falls. While possibly not on everyone’s to-do list but definitely something to consider, is a tandem skydive. This method of skydiving is especially for the not so brave amongst us. Skydiving operations in Swakopmund, which started about 30 years ago, have built up a reputation for being high quality and safe. The two skydiving clubs in Swakopmund offer one-day training courses that will qualify you for a static line jump on the same day. This means you are tied to the aircraft with a special cord that automatically opens your parachute. You can do a shorter course to participate in a tandem jump. Tandem jumps are offered from the Swakopmund airstrip from about 10 000 feet. This is to introduce skydiving to adventure seekers. In a tandem jump you are strapped to a qualified instructor. You jump out of the aircraft together, free fall for about 30 seconds, and glide for about five minutes before landing safely at the airfield. Established skydivers are welcome to arrange scheduled jumps at Swakopmund. It is not only aircraft flights that guarantee adrenalin rushes. Over the past few years, hot-air ballooning has become increasingly popular. It is one of the best ways to explore the Namib Desert in the Dorob National Park. Early mornings – just before sunrise – are the best time to participate in a hot-air balloon flight. This is only possible when there is virtually no wind. At dawn participants assemble in the desert where the balloon is warmed up with liquid propane, which is gasified and mixed with air before being ignited. The flame is directed into the mouth of the balloon. The air temperature inside the balloon rises and causes the balloon to go up. Once in the air, the pilot guides the balloon with the wind currents. Except for the occasional roar of the burner, the flight is silent. From the basket you will have excellent photo opportunities to do justice to the beautiful scenery below. • According to the rules and regulations of the DNP, aircraft, microlights and gliders may overfly the park, providing they are at least 3 000- feet above registered Ramsar Sites and Important Bird Areas – Sandwich Harbour, the Walvis Bay Lagoon, Mile 4, the Cape Cross Lagoon, and the coastal area between Swakopmund and Walvis Bay – and at least 100 feet above everywhere else, and that all Civil Aviation laws and regulations are conformed with. • Aircraft may land only on registered airfields, unless a forced landing is required in an emergency, in which case the required Civil Aviation procedures must be followed. Walvis Bay is one of the fastest-growing towns in Namibia, and the largest on the coast. It is famous not only for its economic activities, but also for its kite-surfing adventures. 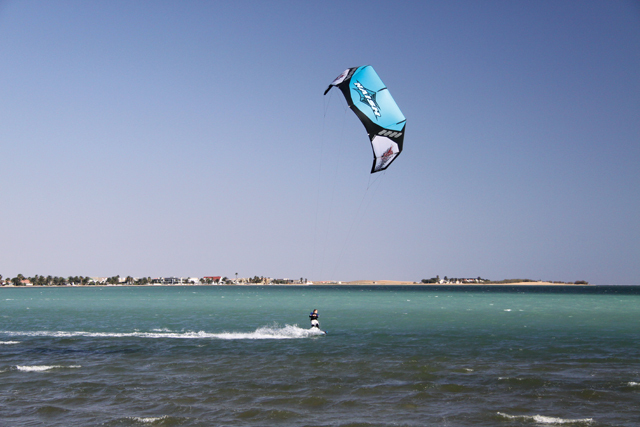 The Walvis Bay Lagoon is the perfect place for this relatively new adventure sport. With strong winds tending to blow in the afternoons, it is the perfect setting. According to a spokesman at the Walvis Bay Kite Surfing Centre, the lagoon is very safe. It has plenty of open water downwind, and lots of shallow water, making it easy to walk back upwind in the beginning phase. Lessons are offered at this kite-surfing centre to introduce adventure seekers to the sport, taking them through all the steps until they are ready to go solo. The place where training takes place is far upwind of the spot frequented by more advanced kite surfers. On most days the wind is strong enough to go kite surfing. The wind only really starts blowing in the early afternoon, picking up gradually towards nightfall. You see kite surfers on the lagoon only when the wind direction is south-east or south-west, the predominant directions. Another adventure at Walvis Bay is kayaking on the lagoon and at Pelican Point. This may not induce the same adrenalin rush as kite surfing, but it brings you very close to nature. Just imagine playing around with seals or racing with a Heaviside’s dolphin, which is endemic to the Namibian and west coast of South Africa. 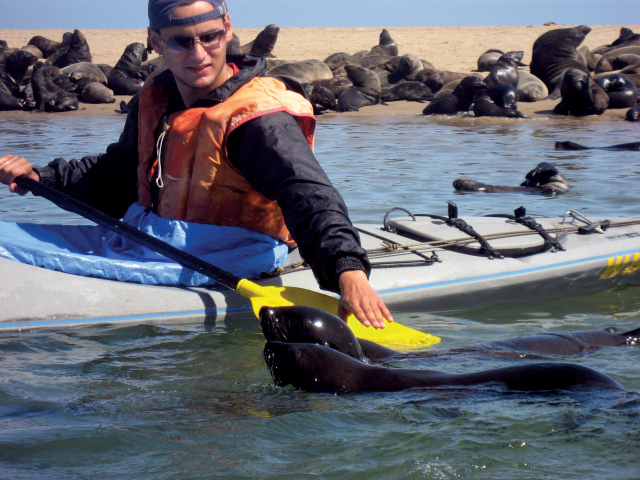 Two types of kayak tours are offered – one at the Walvis Bay Lagoon and the other around the tip of Pelican Point. Both tours start early in the morning when the wind is very calm. For the tour at Pelican Point, tourists are taken by vehicle on a 4×4 route to the Point. From there the kayaks go past the lighthouse and around Pelican Point to the seal colonies. Except for seeing marine life up close, you can also expect to see spectacular birdlife. Thanks to dry bags for cameras, you will be able to capture every moment of this tour. At Pelican Point you will occasionally see surfers hitting the waves. Surfers describe the wave quality at Pelican Point as consistent and average. The size of the swell starts at less than 1 m and builds up to about 2 m, and the wave-length is very long (between 300 m and 500 m). Surfers, however, should be careful of sharks and rips. An international surfing site, wannasurf.com, lists 29 spots in Namibia that are suitable for surfing and that have been tested by surfers. One of these spots is Cape Cross, rated 4.5 out of 5, and said to have the favourite wave quality on the Namibian coast, described as world class and very consistent. The normal length of the waves is between 150 and 300 m with a swell size of about 2 m.
Because this spot is situated next to Namibia’s biggest seal colony, surfers need to be mindful of the seals. Sharks have also been seen in the waters off Cape Cross. Another popular adventure sport in the DNP is paragliding. 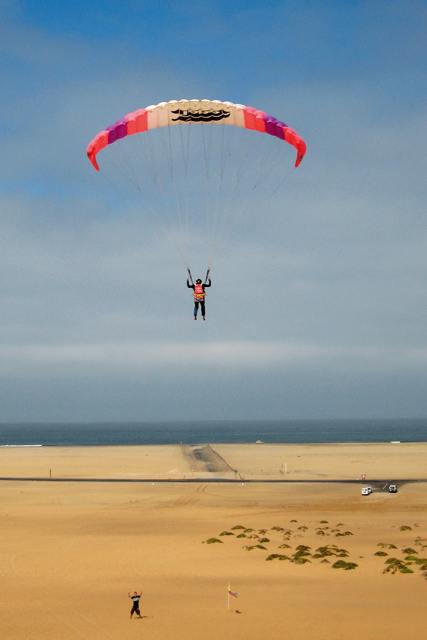 The sand dunes between Walvis Bay and Swakopmund are the best playground for paragliding. The best time to paraglide is between March and May when ground temperatures are not so high. Be prepared to climb the dunes with all your gear. The free flight will hopefully make up for this. • Hand-powered boats (such as kayaks- and canoes), one-person wind boards, and surfers may access all parts of the marine component of the park except areas specifically excluded by means of signs or public notices (for example aquaculture farms). • Rules issued by the Ministry of Fisheries and Marine Resources regarding the safety of marine mammals must be adhered to. • Paragliding is allowed on the western face of the Swakopmund–Walvis Bay dune field, in areas specifically designated for paragliding. An exciting way to get to know more about Namibia’s marine life and even see a dolphin and seal up close is by joining a catamaran cruise in the waters just off the coast of Walvis Bay. Several companies offer such tours to coastal visitors. The catamarans and motorised boats usually depart early in the morning due to the tendency of winds to blow in the afternoon. Highlights on such tours include oyster farms, bird islands and Russian fish trawlers. But it is all about marine life. The dolphins in the bay are now so used to the catamarans operating in their waters that you often see them swimming with the boats. Then there are Cape fur seals, penguins and, from July to November, you might even spot a whale. • Motorised boats, jet skis or yachts may access the marine component of the park except at the registered Ramsar sites (Sandwich Harbour and the Walvis Bay Lagoon) or any other areas specifically excluded by means of signs or public notices (for example aquaculture farms). • Rules issued by the Ministry of Fisheries and Marine Resources regarding the safety of marine mammals must be adhered to, as well as rules regarding boat safety and operation issued by the Ministry of Works, Transport and Communication. This article appeared in the Aug/ Sep 2011 edition of Travel News Namibia.